Tournament Hills in Beaumont, California is a gated community with one and two story homes. It is governed by a Home Owner's Association (HOA) and has community benefits like parks, events and a community lake you can fish in! Many home buyers love the beautiful, and sometimes large homes Tournament Hills has to offer. The community also has landscaped grounds and community surroundings. Tournament Hills is flanked by Fairway Canyon, or The Fairways, which is another large HOA community, and Shadow Creek. It sits west off the 10 Freeway between Cherry Valley Blvd, and Oak Valley Parkway/Tukwet Canyon, and borders the Morongo Golf Club at Tukwet Canyon, a PGA 36-hole world-class golf course. Many homes in Tournament Hills have between three and five bedrooms, and two to three bathrooms. Square footage can range from a modest 1,131 square feet, to over 3,600 square feet. The homes are one and two story stick-built, single family residences, sided with stucco and considered Spanish Mediterranean in design. The homes and community were built by Pardee Homes. Tournament Hills amenities include the regularly stocked private fishing lake, barbecuing and community picnic areas. Lush, green walking trails also wind through the community and around the lake. The community is also secured by automatic remote and key-entry gates and 24 hour security. 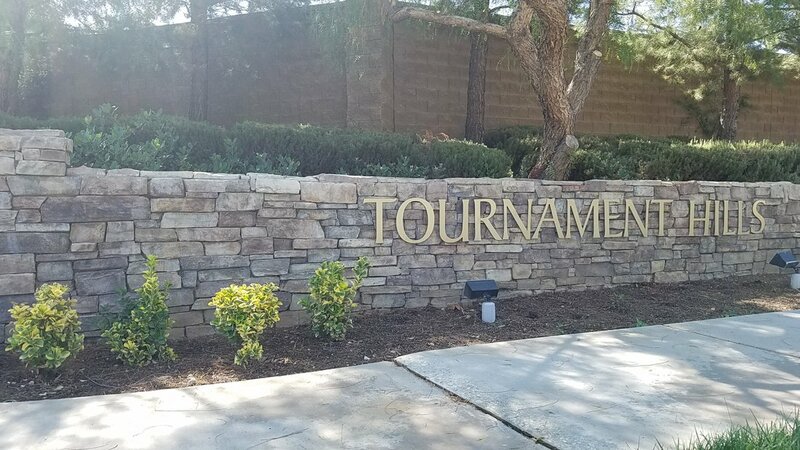 Even though Tournament Hills neighbors the Morongo Golf Club golf course, greens fees and membership is not a current amenity of the community, although there is community access to the golf course. The schools that serve the community include Tournament Hills Elementary, Beaumont High School on Cherry Valley Boulevard, and Mountain View Middle School on Beaumont Avenue. What's your Tournament Hills home worth?